When the Aug. 21, 2017, total solar eclipse descends on the U.S., skywatchers will be plunged into twilight at midday and will witness twisting streamers of light emanating from the edges of the obscured sun. While these features tend to dominate most people's total eclipse experience, there is much more to see if you know what to look for. A total solar eclipse changes the very air around you; the loss of sunlight can cause the temperature to drop 10 or more degrees. The change in lighting also makes shadows look sharper on the ground, so it's possible to see individual hairs on your head in your shadow. During a total solar eclipse, skywatchers might see stars become visible in the daytime or perhaps catch a glimpse of the planet Mercury, which is difficult to see on a normal day because of how close it orbits to the sun. A total solar eclipse occurs when the moon covers 100 percent of the sun's central disk. It is important to note that many of the effects described below will not take place during a partial solar eclipse, when the moon appears to "take a bite" out of the sun but does not cover the star entirely. The Aug. 21, 2017, total solar eclipse will be visible only inside the "path of totality," which stretches from Oregon to South Carolina. Totality (the period when the sun is completely obscured) will last for, at most, 2 minutes and 40 seconds. Check out our main total eclipse guide to find answers to basic questions about when and where totality will be visible. REMEMBER: Looking directly at the sun, even when it is partially covered by the moon, can cause serious eye damage or blindness. NEVER look at a partial solar eclipse without proper eye protection. See our complete guide to find out how to view the eclipse safely. Students in the United Kingdom observe a partial solar eclipse while wearing protective solar-viewing glasses. A total solar eclipse "isn't just about astronomy," Fienberg told Space.com. "[It] is about beauty." Just about every person who has seen a total solar eclipse says it is awesome, amazing, incredible and indescribable. Eclipse chasers like Fienberg will travel around the world to see total solar eclipses. People who have witnessed a total solar eclipse often describe it as a life-changing event, said C. Alex Young, a NASA solar scientist and the agency's lead outreach specialist for the 2017 total solar eclipse. The elation and excitement that a total solar eclipse invokes is on display in many videos takein during total solar eclipses; people witnessing the event shout, moan and repeat exclamations like "Wow! Oh wow!" and "Oh my god!" and other phrases we won't print here. "[It's] about being out in nature and being one with the universe," Fienberg said. "I mean it sounds silly, but you really feel like you're just part of it all and you're privileged to be able to see such a beautiful thing." Eclipse experts like Fienberg and Space.com columnist Joe Rao recommend that people who are viewing a total solar eclipse for the first time sit back and enjoy the show — don't fuss with a camera during your first viewing. The jets and streamers present in the sun's corona become visible to the human eye during a total solar eclipse. These features are not typically visible in photographs of a total solar eclipse; this composite image makes them visible. The dominating feature of any total solar eclipse is the appearance of the sun's atmosphere. The layer closest to the sun's surface is a deep-red ring called the chromosphere; above that is the corona. The word "atmosphere" most likely makes people think of the indistinct haze that sits atop the Earth's surface. But the sun's corona is vastly different. "It's not just an amorphous glow," Fienberg said. "It's a tangle of streamers and jets and loops and twists and all kinds of stuff, because its controlled entirely by the sun's magnetic field, which is very tangled and twisted. It creates these streamers that go out into space along which the solar wind flows." The structure visible in the sun's corona is almost impossible to capture in a single photograph. That's why many photographs of the sun during a total eclipse show only a fuzzy crown of light emanating from the edge of the moon. A group of photographers used multiple images to create a composite, which you can see above, that more accurately represents what the human eye sees during totality. When the moon completely blocks out the sun during a total solar eclipse, daylight suddenly turns into twilight. This change of lighting is so overwhelming that animals will sometimes behave as if night has arrived early; birds typically stop singing when the light dims, and cows have been observed heading back to the barn, under the impression that it is time to settle in for the night, according to Fienberg. This sudden change in lighting is not quite so disorienting for humans, but it's still one of the most incredible features of a total solar eclipse. On Aug. 21, the shadow of the moon will be about 70 miles (110 kilometers) wide, and will travel from Oregon to South Carolina along the path of totality. What's more, it's possible for observers to see the shadow coming toward them in the last few minutes before they experience totality, and to see the shadow moving away from them in the minutes after totality, Fienberg told Space.com. This is sometimes described as a "cone of darkness" or a "tornado of darkness" moving across the landscape. The shadow of darkness crossing the Earth's surface is clearly visible in the video above, which was taken from an aircraft. At the edge of the path of totality, where the sun's disk is 99 percent covered by the moon, observers might notice a slight dimming of the light. But for the most part, this effect is visible only where the moon entirely covers the face of the sun. When the sun disappears behind the moon during a total solar eclipse, it often causes such a quick change in the air temperature that people will reach for a sweater, according to Fienberg. During the Aug. 21, 2017, total solar eclipse, two scientists will measure the temperature drop from Salem, Oregon. They also measured the temperature change during the 2015 total solar eclipse, which took place in Svalbard, an island in the northern Norwegian archipelago. The temperature dropped about 15 degrees Fahrenheit (8 degrees Celsius) during that total solar eclipse. The gorgeous, streaming jets of material in the sun's corona that become visible during a total solar eclipse are not the only things normally hidden by the brightness of the sun. Stars and most of the planets in the solar system are not visible until close to sunset or long after the sun has gone down. But during a total solar eclipse, stars and planets may be visible . Venus, which orbits closer to the sun than the Earth does, is "impossible to miss" during an eclipse, said Fienberg. "It's almost always visible during totality." Jupiter and Saturn may become visible if they are positioned in the daytime sky. Mercury is fainter than Venus and orbits so close to the sun that many people have never seen this planet in the sky. It is typically visible only just above the horizon shortly after sunset, and only when it is positioned to the side of the sun, rather than in front of or behind it. Mercury will be visible during a total eclipse only if it lies just to the side of the sun, which will be the case during the Aug. 21 total solar eclipse. But seeing these planets during a total solar eclipse, particularly when they are close to the sun, "can really be quite striking," Fienberg said. During the August eclipse, the star Regulus in the constellation Leo will sit close to the sun and should be visible, Fienberg said. A bead of the sun's disk emerges from behind the moon during a total solar eclipse. On a normal sunny day, a person standing outside will cast a shadow on the ground. The shadow will have the same general shape as that person, but "the edge is kind of fuzzy," Fienberg said. That's because light from the sun isn't coming from a "point source," but instead from the entire disk, so different beams of light hit an object (like a person) at slightly different angles. But during an eclipse, as the sun's disk is slowly reduced to a small sliver, the source of the light is reduced to a smaller area and the shadows cast by people and objects sharpen, Fienberg said. "You can see individual hairs on your head and on your arms in the shadows," he said. "It's very different than what you're used to seeing." This effect is visible outside the path of totality where the moon obscures a significant portion of the sun's disk. The total solar eclipse also creates a strange phenomenon known as shadow bands, in which alternating streaks of light and dark appear on the ground. 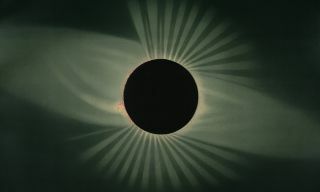 Shadow bands appear shortly before totality (only "tens of seconds" according to Fienberg), and are usually visible only in places where the ground is "really smooth, with a light, uniform color," such as places covered by snow or sand. Shadow bands are "unpredictable from eclipse to eclipse," according to NASA, and there is no complete explanation for the phenomenon. It seems likely that the appearance of shadow bands has something to do with Earth's turbulent atmosphere, which can distort light from distant objects (a serious issue for some ground-based telescopes_, the agency said. Looking at these objects through the atmosphere can be like looking up from the bottom of a swimming pool, and in fact, this is what causes stars to appear to twinkle when viewed from the surface of the Earth.